I stalked this skirt for months. I went back and forth about whether or not I should buy it. I didn't, after all, really need yet another sequin skirt. Then I saw it featured on Oh Joy's blog and I finally decided I had to have it. The only problem was that by the time I had made up my mind, it was sold out on Zara's website! Lucky for me, the Zara near me had one in stock, so I made the trip to the store in search of my coveted sequin skirt. After combing the shelves, the skirt was nowhere to be found and I was very disappointed, as it seemed unlikely that the skirt would ever be mine. Demoralized, as a long-shot I asked the store clerk about it and, in another stroke of luck, he emerged from the stockroom about 10 minutes later with my lovely silver skirt! At that point, I knew it was meant to be, so, as you can see, I'm doing a little "sequin shimmy" in honor of finally finding the skirt! A beautiful sequin skirt and a perfect match with other elements of your outfit! That *is* an amazing skirt! How wonderful that there was one in hiding at your Zara store. Hopefully, it will be done shedding after awhile. Love it! Everyone should wear sequins more often! SO much fun, I absolutely love your fun style! Okay this is one of the funnest skirts I've seen you wear! 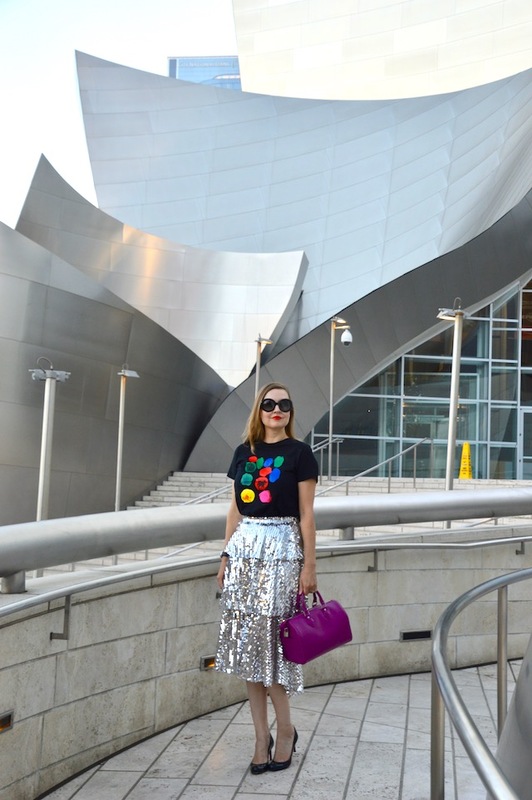 I love the glitz and glam of it and how you styled it with the t shirt! A trail of sequins is a sign of being visited by fairies! Why wouldn't you be happy about that? Love the combo of shiny and graphic. And your setting is amazing. Great post - thanks so much for sharing. That was a cute story. Love the colors you added to this look- your bag a favorite too! Perfect background to to highlight the silver sequins.